January Jones just needs one guy in her life — her 5-year-old son, Xander. 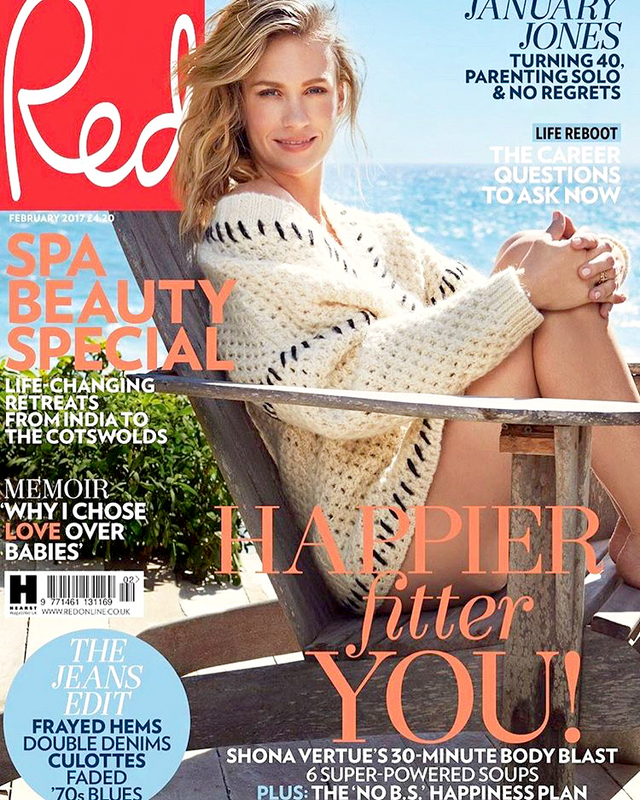 The Mad Men alum opened up about being a single mom in a new interview with Red magazine. "It’s good to have strong women around a man. To teach him to respect women. He doesn’t have a male person in his life saying ‘don’t cry’ or ‘you throw like a girl.&apos; All those s—ty things dads accidentally do," Jones, 38, said. "I just don’t feel I need a partner. Do I want one? Maybe. But I don’t feel unhappy or lonely," she continued. "It would have to be someone so amazing that I would want to make room. Someone who would contribute to my happiness and not take away from it. I realize I have very high expectations and will probably have to compromise but my life is so full. It’s not like, ‘Aww, I wish I had a man.’ After I had Xander, I went on a couple of dates and I was like, ‘I’d rather be at home sleeping, or watching TV or hanging out with my kid.&apos;"
Jones welcomed her son in 2011. "My younger sisters [Jacey and Jina] and my mum and my doula were in the room. My brother-in-law and my dad were next door. I only wanted women with me," she recalled of giving birth. "And I was embarrassed — your body does all these crazy things. It was a 30-hour process but it was awesome. I’d love to do it again." PHOTOS: Celebrity Single Moms Who Do It All! As a single mom, she has to play both "bad cop" and "good cop." "I don’t want to be bad cop. But to have his respect, I have to be both," she said. "I mean, I’m an emotionally immature person. I’m an actor for God’s sake. I see myself behaving like a child all the time." Jones has never disclosed the identity of Xander&apos;s father to the public. In 2013, the actress told The New York Times that the information was only her "son&apos;s business." "Jack Nicholson once told me: &apos;You should never give your personal life away, otherwise people will pick you apart. They&apos;ll never believe in your character,&apos;" she said at the time. Jones, who previously dated Ashton Kutcher, more recently dated her Last Man on Earth costar Will Forte. In September 2015, Us Weekly exclusively confirmed that the couple had split after five months. "People want to set me up all the time and I’m like, ‘No way.&apos; If I meet someone and we go out, then fine, but I’m not going to go look," Jones told Red. "The moment I see someone who I think is cute, I Google him and, oh, he’s 25, and I’m thinking, what is my problem?!" Jones does have a type though. She admitted that she and her sister usually go for men who "like tattoos, guitar" and who are "kinda dirty." "I want a manly man in flannel, with a beard and an axe," she said. "But then there’s always something wrong with him. Like he’s a Republican."